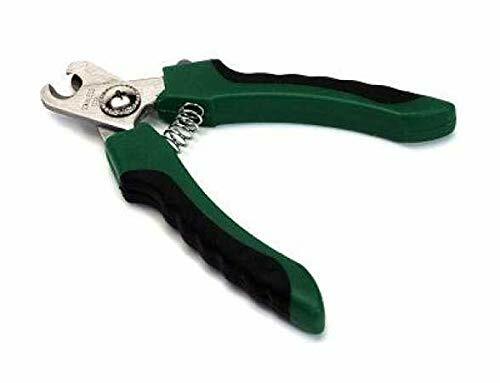 Top 12 Best Dog Nail Clippers of 2019 + Guide on How to Trim Nails! Do you hear a click click click when your dog walks down the hallway? If you do, then it’s time to clip your dog’s nails. Regular maintenance of your dog’s nails is important for their health and comfort and it’s a great training and bonding experience for the both of you. Let’s talk about the dangers of nail neglect, the benefits of nail maintenance, how to do it, and what the best dog nail clippers are. Some dogs have clear nails and some have black nails. The anatomy is the same, but clear nails are easier to clip because they are easier to see. A dog’s nail includes an outer shell and an inner quick. For a dog with clear nails, the shell is the translucent part and this is safe to cut. The quick is the pink part and it is filled with nerves that can bleed. When clipping nails, if you just barely hit the quick, then the nail will bleed a little. If you cut deeper into the quick, it is painful for the dog and will bleed quite profusely. You should avoid this at all costs and have a backup plan, like styptic powder, in case it happens accidentally. Regular trimming of your dog’s nails is important for their health. It isn’t just for aesthetics. If your dog’s nails are too long, it can be painful and cause lasting damage to your dog. Nails that are too long hit the ground and that force puts pressure on the structure of the leg and foot. Tendons can be injured over time. The feet can become splayed and deformed. Your dog can experience a reduction in traction making it more difficult for them to maneuver. Trimming your dog’s nails will help keep them healthy and comfortable. And if you do it on a regular basis, the quick will actually recede from the end of the nail. Shorter quicks are good for a dog’s well-being and make the nails easier to maintain. It’s also a great training and bonding exercise. You can teach your dog to trust you when they are in a vulnerable position and they’ll even love it if you make it rewarding enough for them (more on that later). 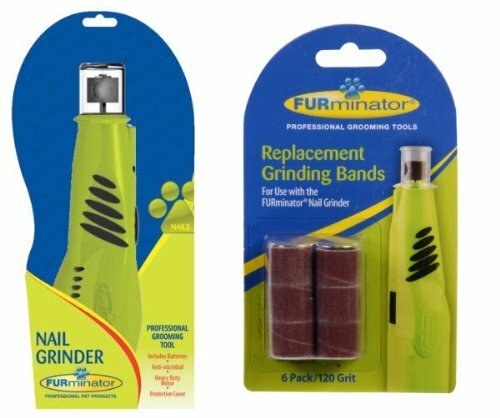 There are three different tools you can use to trim and maintain your dog’s nails. Each one has its benefits depending on the size and type of dog you have. We’ll help you learn about them so you can make the right choice for your dog. The three tools are guillotine clippers, scissor clippers, and grinder tools. Guillotine clippers are great for small dogs and medium-sized dogs, but not necessarily for large dogs. They are very easy to use. They have a small hole into which you insert the dog’s nail. You line up the edges with where you want the cut to be made. Squeeze the handle and a blade will slide across the hole, trimming the nail. Make sure the blade is facing you and not facing the dog. There are three drawbacks for guillotine clippers: first, they are not strong enough to cut through the thick nails of larger dogs; second, the blade will need to be replaced with use; and third, it is more difficult to cut off small shavings if this is your preferred method of nail trimming. Also known as Miller’s Forge Trimmers, scissor clippers are great for dogs of all sizes. In my opinion, they are the best dog nail clippers. 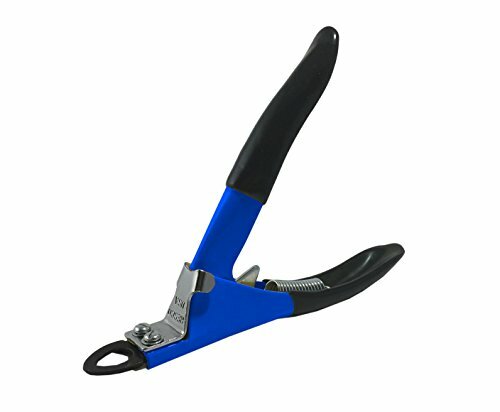 They have the power to cut cleanly through the thick nails of larger dogs and they are more versatile than the guillotine clippers so you can cut small shavings off at different angles if that is how you like to trim your dog’s nails. Their appearance is very similar to regular scissors with the difference being that the blades have half-moon indentations. When opened, the blades make a small hole in which you can fit the nail. Some people hold the clippers horizontally, some hold them vertically, and you can angle them to clip shavings off the nail. Scissor clippers often come with a safety catch. When it’s in place, it only allows you to clip off a small amount of nail at a time, making it more difficult to hit the quick. Unlike the guillotine clippers, the blades of scissor clippers do not have to be replaced. The drawback here is that they require a little more strength so it may be harder for people with arthritis or a weak grip to use. 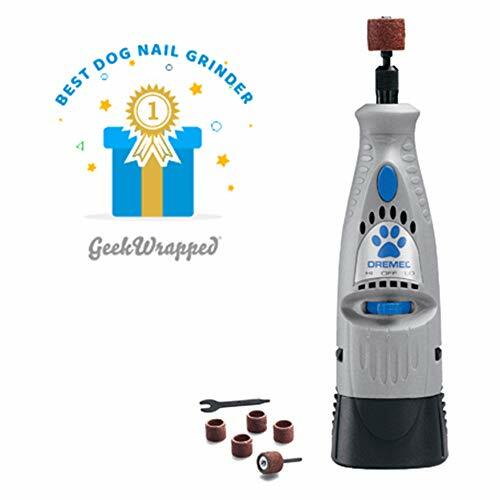 Grinder tools are great for smoothing out edges and shaping a dog’s nails. Some dogs hate clippers and they might be more comfortable with grinder tools. However, the noise can scare them. If you’re going to try them, introduce them in a positive way and see how your dog reacts. The grinding can take a long time in comparison to clipping. I actually like using grinder tools as a supplement to clipping. First, trim the nails with a clipper, then use the grinder tool to smooth and shape the nails. They’re a dynamic duo. Grinder tools are nice because it’s more difficult to cut deep into the quick than with clippers and they do cauterize the wound if the quick is hit. However, some people use this as a measuring tool; they use the grinder tool until they hit the quick making the dog react. This is cruel to your dog. You should measure with your eyes and try your best not to go too far, hit the quick, and hurt your dog. And remember, grinder tools will get hot so use them a little at the time so your pet doesn’t get hurt. Go slowly and take small breaks. Depending on which tool you prefer, we’ve done the research and found the best in all three categories. Resco are the inventors of the guillotine style nail trimmer (way back in 1937) and they have made them in the US ever since. They have patented blade replacement technology and it’s pretty cheap to replace the blade in comparison to buying new clippers every time the blade gets dull. They exhibit deluxe grips and a premium powder coat for quality performance, comfort, and style. They also have a lifetime warranty! Buy replacement blades here. These trimmers are stainless steel and they are appropriate for left or right hand use. Safari guarantees their quality. 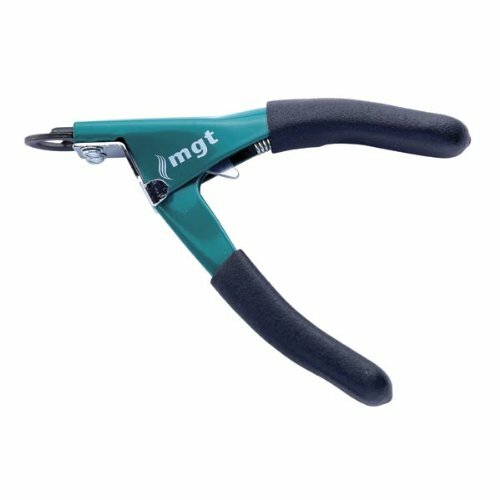 The guillotine style makes trimming nails easy and the vinyl covered handles provide a secure grip. WPS adheres to the highest standards for pet grooming. They design their professional dog nail clippers at an optimal angle to avoid hitting the quick of the nail. The handle is ergonomic with a non-slip for easy and comfortable use. These clippers are spring-loaded to prevent fatigue. WPS stands by their products with a 100% satisfaction guarantee. 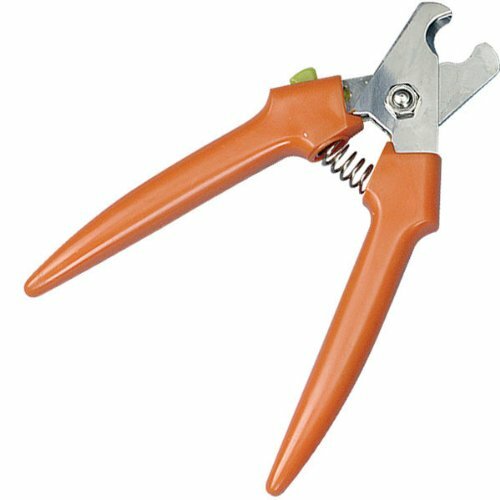 There are great nail clippers for easy nail trimming. The handle has textured rubber grips for optimum control and comfort. They are 5-inches in length and are color-coded for blade size identification. Teal for large dogs, blue for smaller dogs. 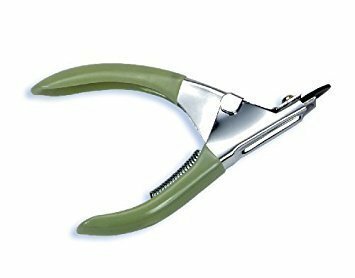 These clippers are specific for large dogs with optimal leverage to easily cut thick nails. They do come in a size for smaller dogs as well, which you can find here. 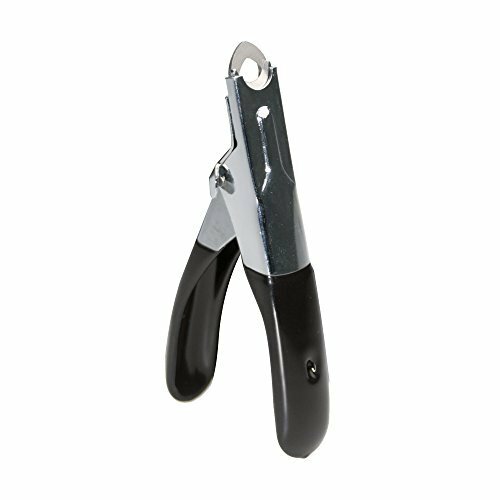 These dog nail clippers are made with high grade stainless steel and are backed by a 100% Lifetime Warranty. They will stay sharp with repeated use. The sharp blades cut quickly and cleanly, specifically sized for medium and large dogs. It comes with a safety lock so you can keep it in a closed position when not in use. The handles are shaped to fit your fingers and have anti-slip rubber making them easy and comfortable to use. Safari makes these trimmer from the finest quality stainless steel for long-lasting sharpness. 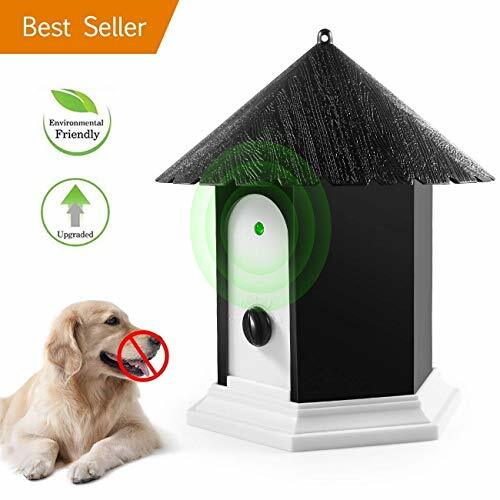 It comes with a safety stop to prevent hitting the quick and injuring your dog. This one is ideal for small to medium-sized dogs with rubber handles for an easy grip. Koodella provides a high quality, stainless steel trimmers. They have a safety stop to avoid over cutting and a safety lock for safe storage. Its comfortable ergonomic handle means easy use. It is built to last use after use. They have a 60-day money back guarantee and a one year warranty for broken clippers. 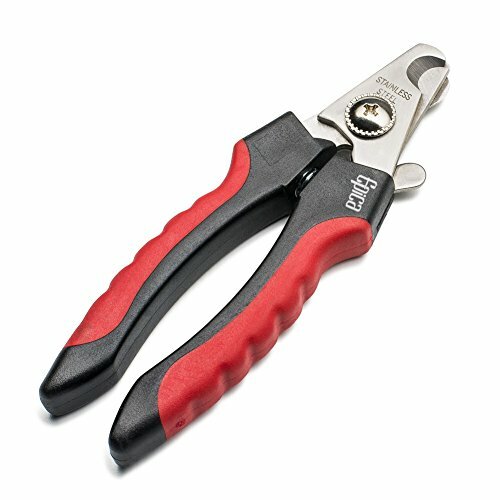 Boshel makes professional-grade dog nail clippers. Their design makes it virtually impossible to make a deep cut, making it much harder to make a mistake and hit the quick of your dog’s nail. It has a heavy duty 3.5mm stainless steel blade to provide a quick clean cut every time. The handles have an ergonomic, non-slip design for comfortable use and it comes with a free nail file. Millers Forge is the namesake for the scissor type of clippers. They are a high-quality, heavy duty brand made in Italy. These clippers are great for large dogs. They are constructed from German stainless steel and will outlast any other nail clipper. This rotary tools provides an alternative to clipping that is less stressful, effective, and safe. It is cordless so you have plenty of control and nothing getting in your way. There are two speeds so you can safely grind your dog’s nails at your comfort level. It has a 3-hour battery charger and a 4.8V battery. And it’s back by a 2-year warranty. This grinder has a diamond bit. It is safer and more effective than clippers. It’s ideal for shaping, smoothing, and removing length from your dog’s nails, though it is still a good idea to clip nails first if they are very long. This tool is lightweight with an ergonomic design and is very quiet so as not to scare your dog. But it’s still powerful and durable and comes with a 180-day warranty and lifetime after-sales service. This tool is high performance and lightweight. Its design ensures safe, efficient trimming. It has an automatic LED light to help you see what you are doing. It takes AA-alkaline batteries (4 are included). Like I said before, clear nails are easier to clip safely than black nails are, but we’ll talk about both so you feel confident when tackling the task. If your dog has never had her nails clipped before, here are some tips to get started. First introduce her to the clippers and/or grinding tool. Set it down in front of her and give her a treat. Clippers mean good things happen to me! She’ll think. If it’s a grinder tool, turn it on and let her check it out. Treat her again. Once she’s confident checking out these tools (looking at them, sniffing them, etc), then you can lightly touch one of her paws with them. Give her another treat. What a fun game! Nothing much is happening and your dog is getting some great rewards. After you’ve built up confidence with the tools, then you can work on holding her paws. Touch them gently and treat her. Ask her to give you her paw and treat her if she does. Massage her paws softly with your hands, let go, and treat her. Do these things gradually and build up her comfort level. This won’t happen in one session, but practice a couple times a day. It will be worth it when you have a dog that doesn’t put up a fuss when you clip her nails. When you’re both feeling comfortable and confident, then try clipping her nails. You can use baby oil or coconut oil to help make the quick easier to see. If your dog’s nails are very long, just cut them a little bit and then repeat the next week. Remember to have some styptic powder on hand. If you do hit the quick and it starts bleeding, take a pinch of styptic powder and press it gently and firmly on the dog’s nail where it is bleeding. Hold for a few seconds and let go. Rinse your hands afterward because it’s not good to accidentally get styptic powder in your (or your dog’s) eyes. Examine your dog’s nails. The ends should be translucent and you should be able to see the thick pink quick. You want to clip close to the quick, but avoid hitting it. Take your time looking at it to be sure. When you clip, clip quickly so as not to cause discomfort to your dog. Then take the grinder tool and sand down the sharp edges. If you are not using a grinder, then you can clip little shavings off of the ends to smooth them down. Check out this video for a more detailed explanation. The quick is impossible to see if your dog has black nails so clipping is riskier. With practice it will become easier. Examine your dog’s nail from the side. You should see that it hooks. It’s safe to clip at that point. If you are too anxious to clip that far, then just clip a tiny bit off at a time. When looking head on at the end of the nail, you will see a black center and that’s your cue that the quick is close. Once you see that, then you know it’s time to stop. Check out this video for a more detailed explanation. Thanks for reading my article about trimming your dog’s nails. I hope you found it helpful. If you have any questions, feel free to contact us and we’d be happy to help. Or feel free to leave a comment below. We love to hear from you!